Port Louis boasts some fantastic attractions to keep tourists off the beaches, offering lots to see and do away from the sand and sea. One of the most popular spots to visit is the Champs de Mars racecourse, which is one of the oldest in the world, having celebrated its first race in 1812. A day at the horse races is wonderful fun when staying in Port Louis. The Blue Penny Museum is the cultural and historical highlight of the Caudan Waterfront and contains two of the oldest and rarest postage stamps in the world; this attraction will only be of interest to serious culture vultures, but it is a well-organised and interesting attraction. The town also offers a plethora of shopping opportunities, including malls, street-side shops, and vendors, as well as bustling markets. Within the crush of the busy Port Louis Central Market, visitors can buy all sorts of treasures, making it a definite win for shopaholics. 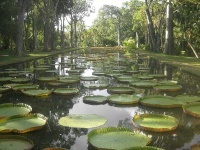 A stroll and picnic in the Royal Botanical Gardens of Pamplemousses is also something to do in town, and there are some worthwhile inland excursions from the city, like a trip to the old sugar cane estate of Domaine Les Pailles. And then, of course, there are the beaches. The tourist hubs of Grand Baie and Flic en Flac, with their long white beaches, calm waters, and coral reefs are close to Port Louis and are a great favourite with visitors. Travellers in Port Louis will find themselves getting around a lot of the town by foot, as none of the distances are too great. Taxis are readily available and efficient, and are easily recognisable by their yellow signs. Car rental agencies such as Hertz can be found throughout the town for visitors wanting to explore the island themselves.